Species of gigantic animals that once roamed Australia were long gone by the time people arrived, a major review of the available evidence has concluded. The research challenges the claim that humans were primarily responsible for the demise of the megafauna in a proposed "extinction window" between 40,000 and 50,000 years ago, and points the finger instead at climate change. "The interpretation that humans drove the extinction rests on assumptions that increasingly have been shown to be incorrect. Humans may have played some role in the loss of those species that were still surviving when people arrived about 45,000 to 50,000 years ago – but this also needs to be demonstrated," said Associate Professor Stephen Wroe, from University of New South Wales, the lead author of the study. "There has never been any direct evidence of humans preying on extinct megafauna in Sahul, or even of a tool-kit that was appropriate for big-game hunting." About 90 giant animal species once inhabited the continent of Sahul, which included mainland Australia, New Guinea and Tasmania. "These leviathans included the largest marsupial that ever lived – the rhinoceros-sized Diprotodon – and short-faced kangaroos so big we can't even be sure they could hop. 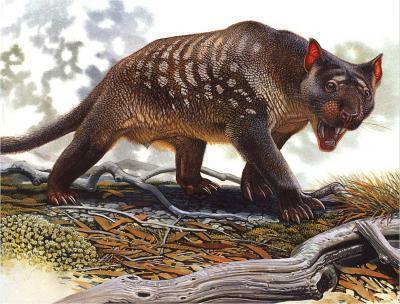 Preying on them were goannas the size of large saltwater crocodiles with toxic saliva and bizarre but deadly marsupial lions with flick-blades on their thumbs and bolt cutters for teeth," said Associate Professor Wroe. The review concludes there is only firm evidence for about 8 to 14 megafauna species still existing when Aboriginal people arrived. About 50 species, for example, are absent from the fossil record of the past 130,000 years. Recent studies of Antarctic ice cores, ancient lake levels in central Australia, and other environmental indicators also suggest Sahul - which was at times characterised by a vast desert - experienced an increasingly arid and erratic climate during the past 450,000 years. Arguments that humans were to blame have also focused on the traditional Aboriginal practice of burning the landscape. But recent research suggests that the fire history of the continent was more closely linked to climate than human activity, and increases in burning occurred long before people arrived. "It is now increasingly clear that the disappearance of the megafauna of Sahul took place over tens, if not hundreds, of millennia under the influence of inexorable, albeit erratic, climatic deterioration," said Wroe. Published in Proceedings of the National Academy of Sciences.